The recipient of the 2018 Crow Award reveals details of flu evolution at the smallest —and largest—scales. For many viral diseases, a vaccine can provide lifelong protection. But for flu, you need a new shot every year. The influenza virus evolves so fast it presents a constantly moving target for both our immune systems and public health authorities, fueling epidemics like the particularly bad season we just endured. With over 30,000 people hospitalized in the United States alone this season, the flu provides a dramatic reminder of the importance of understanding evolutionary dynamics. Katherine Xue, a graduate student at the University of Washington, is revealing the mechanics of influenza evolution on scales ranging from an individual person up to the entire planet. 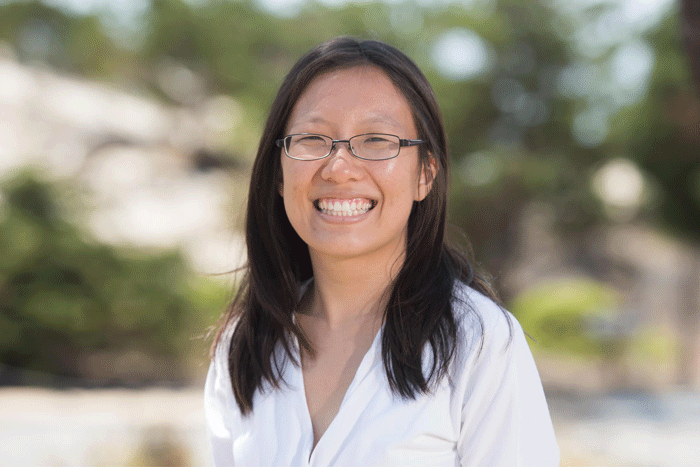 Xue was awarded the 2018 James F. Crow Award for Early Career Researchers for her doctoral work on the subject after a presentation at the Population, Evolutionary, and Quantitative Genetics Conference in May. In a special session of talks by Crow Award finalists, Xue spoke about using deep sequencing to examine diversity in flu virus populations. Xue approaches clinical topics with the conceptual tools developed by evolutionary and population geneticists. Linking ideas across fields is characteristic of Xue, says her mentor Jesse Bloom (Fred Hutchinson Cancer Research Center / University of Washington), whether it’s between medicine and evolutionary theory or between science and the humanities. When Xue first rotated in Bloom’s lab, she was working on a molecular virology project about how a particular viral protein binds to a cell. In the course of examining sequence databases, she noticed the mutation she was studying was often ambiguously annotated. Inspired by this hint of population diversity, she wondered whether the two viral variants might interact with each other. She was able to establish that the mutation tended to occur alongside the wild type version within a population; the mutation was deleterious to virus reproduction on its own but beneficial when mixed with wild-type. This example of cooperation suggests that interactions between different variants within flu populations can be important factors in virus evolution. But can evolution be detected within the virus population of a single individual? Xue was drawn to the question of how global flu evolution traces back to the founding infections in which each mutation must first arise. “I was intrigued because it was hard to imagine how this works,” says Xue. “Flu infections are very short; there’s not a lot of time for a new mutation to reach frequencies large enough to ensure it makes it over to the next infected person.” In the language of population geneticists, flu populations are repeatedly subjected to extreme bottlenecks. But observing such rapid evolution in action is extremely challenging. Xue and her colleagues in the Bloom lab used a unique approach to get around this problem. They partnered with clinicians Michael Boeckh and Steve Pergam at the Fred Hutchinson Cancer Research Center, who had collected samples from four immunocompromised patients over the course of their months-long flu infections. Deep sequencing these samples gave them an in-depth view of a process that would normally be finished within days in a person with healthy immune defenses. The results were dramatic. Over the span of about two months, there was a substantial amount of flu evolution within each patient. Mutations arose regularly, fluctuated in frequency, and even became fixed in the population in a few cases. They also saw evidence that some of these changes are due to selection. The same mutations would often arise independently and then rise to substantial frequencies in multiple patients, suggesting these particular changes were adaptive. Remarkably, the mutations that arose repeatedly in different patients were sometimes the same mutations that spread through the global flu population within the next decade. The immunocompromised patients seemed to be microcosms of global evolutionary patterns. “We were astonished,” said Xue. Most of these recurring mutations affect the part of the flu haemagglutinin protein that is most recognized by the host immune system, so the team hypothesizes that the changes help the flu escape host defenses. These results raise many questions about how evolutionary dynamics interact across scales. How far do the conclusions generalize? Where and when do natural selection and genetic drift act? How do normal week-long infections generate enough diversity to fuel rapid global evolution? Could understanding these processes translate to better flu season predictions? Xue’s graduate research continues to explore flu evolution with these questions in mind. A few years ago Xue helped start the UW Genomics Salon, which is a group of students and postdocs who take part in freeform discussions about the intersections of science and society. These discussions touch on policy, advocacy, communication, education, representation, law, art, and a host of other topics. Watch #PEQG18 presentations from all the other outstanding finalists for the Crow Award here.